Who was Texas Attorney General John Ben Shepperd? What did he stand for? What did he accomplish? What is his legacy? 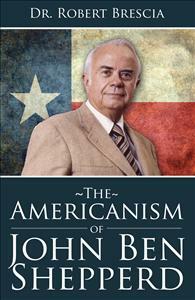 The Americanism of John Ben Shepperd answers those questions and more. Beginning his professional career upon graduation from the University of Texas at Austin with a law degree in 1941, he served his country in World War II, returning home to begin his political career. John Ben was a firebrand of a public speaker and he knew how to excite people to action. Expertly organizing them into committees and groups, he orchestrated a great deal of swift progress for Texas during his 1953-57 tenure as Attorney General. Texas’ only public leadership institute was named after him and renders service to the youth of Texas today by teaching them leadership, ethics, and public service. John Ben’s speeches are the stuff of legend – they can inspire people to action today as they did in the 1950s. John Ben’s values and principles are badly needed today. If you are a young leader improving your skills and action – this book is for you. If you are a seasoned leader in search of a refresher – this book is for you. If you are an elected or appointed official looking to provide the best possible service to your constituents – this book is for you.